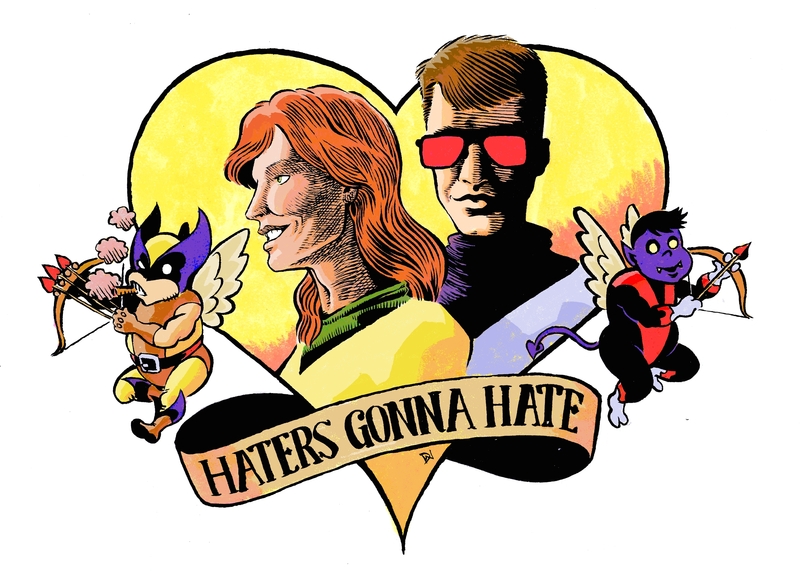 In which Rachel and Miles celebrate an anniversary with a retrospective of one of the great romances of the Marvel universe; the Summers/Grey family tree is more of a transdimensional strawberry patch; the X-Men play some football; Professor Xavier is not a jerk; and Scott Summers and Jean Grey are the power couple of existentialism. First, Miles, you and I have some VERY different opinions on how to pronounce a couple of words. I used to pronounce “Rahne” as “Rain” Sinclair; then one of the cartoons (I’m fairly certain it was X-Men: Evolution) taught me to pronounce it “Ronnie.” Second, I’ve never heard “CANuncklehead” before. I’m pretty sure it’s “caNUCKlehead.” As in, “Canuck,” (pronounced “cuh-NUCK”) like a Canadian person, but also “knucklehead,” only pronouncing the “k” instead of letting it be silent. Second, to both of you, I think it’s awesome that you guys are in love and not afraid to say it. We definitely live in a time when being ironic and flip and sarcastic is the norm. It’s easy, and it’s safe. To love each other and be unafraid to say it is a true gift, and an inspiring witness to everyone around. Keep being in love; you wear it well. The comics definitely established more than once that Rahne’s name is pronounced exactly like rain. I have no trouble believing that the cartoon got it wrong. I posted an earlier version of this comment with a link to a panel that establishes the “rain” pronunciation, but I suspect that will be stuck in moderation until R&M get back from vacation, because it had a URL in it. I love this episode. You guys are so LOVELY. Does Jean ever get to have another actual romantic relationship? There are flirtations with Logan, obviously, and she’s manipulated by Mastermind, but while Scott has a few different girlfriends, does Original Jean stay locked into Scott & the X-Men always? And the ongoing problem I’ve got with “One” as Jean and Scott’s first dance – and I admit it’s not much of a problem, because I kind of love cognitively dissonant lyrics/song dedications – isn’t that some of the lyrics are a bummer, because some of the lyrics taken out of context are also pretty romantic, but that I scan it as pretty much specifically being about a codependent and emotionally abusive family relationship, which makes it apt to the characters but not particularly wedding-appropriate. I always feel when listening like Bono sees the love in the song as more of a trap than a gift. Actually, the song One was written during a time when the band U2 was going through a really bad time internally. It was about how they needed to either get past their problems or break up. So, I can see how it fits Scott and Jean. It was also still a pretty popular song when the comic came out. The only song that came out at the same time that would fit their relationship and be popular enough to be known by the readers would be Meatloaf’s I Would Do Anything For Love. Gosh, it would’ve been a VERY different story if it’d been Meatloaf, huh? I didn’t know that about the origin of the song, and it makes sense. Having said that, I don’t think it’d resonate with people the way it does, or fit any sort of romantic context, if lyrically it was explicitly about a rock band having issues rather than just a general hymn to codependent, difficult relationships. Well I know that Every Breath You Take by the Police is a popular wedding song. Which creeps me right out because that song is about Sting’s ex stalking him after they broke up. My older sister used White Wedding from Billy Idol, um yeah, not going to go there. That being said I personally would not use One either. BTW, I did some researching and the only other person that Jean dated even casually was Warren Worthington III. Liked the comment about how you guys send the Scott/Jean silhouette to each other as love letters. My wife and I often say, “I love you” using “Can I have one more day?” “Every one I have left,” taken from JLA 90’s exploration of the ways the Batman/Wonder Woman relationship could have gone. What was the song used for the Wolverine speaking parts? I’m wondering this as well. I agree so hard about John Romita Jr.’s approach to faces. Especially women’s faces. Especially at 3/4 view. It’s fully the reason why I am not a fan of the Fatal Attractions series (even though I have it still from my childhood, and it was during my prime X-men reading period, also what’s up with Amelia Voght’s hair as drawn by him? X-Men 300 would have been so much better without that distraction as well. It’s also the reason I did not read Kickass when it came out. Because I HATE HIS FACES. It’s SO WEIRD, too, because they were so much better when he was just starting. And then this. Okay so I hate to be ‘this’ guy, especially since this show isn’t political. The last thing I want to do is argue economics, but there was a line about the brick wall being shoddy capitalism work? I myself am pro-capitalist (but very against crony and corrupt capitalism) but I don’t judge anybody who thinks another way would work out. Stereotyping from other offhand comments in though I show I, maybe wrongly, maybe not, assumed that you guys were more socialist leaning…Again, that’s fine by me, I still like you guys and your show no matter what your economic views are..I just didn’t get the comment? Does capitalism have a reputation for being shoddy work? I always seen it the other way around, that if you’re a private company you want to do a good job because of competition with other companies. Like the wall company would want to build a great wall so they get hired again. Again I don’t want to debate or sound like a troll at all…please don’t think I’m a troll, I love the show…just didn’t get the comment? Again to reiterate…not a troll, just asking…Love the show! Ahahahahahano. While the practical execution of the economic principles you’re describing is actually pretty debatable, in this particular case, the line in question is an old family joke. According to the annals of Edidin family legend, someone once told my several-greats-aunt Pearl–a hardline Socialist, like a lot of Jewish immigrants–the classic joke about a cop trying to chase off a bum leaning against a building. “What are you doing here?” the cop asks. “Why, I’m holding up the building!” the bum tells him. Cop laughs this off as ridiculous and chases away the bum, at which point the building falls down. I know nothing else about Pearl–including whether this actually happened or is family apocrypha–but the callback has survived through several generations. Oh Okay! It all makes sense now! I could kind of sense a joke in there but never quite understood it. Thanks for clearing it all up. And I really hope you don’t see me as some capitalist internet. 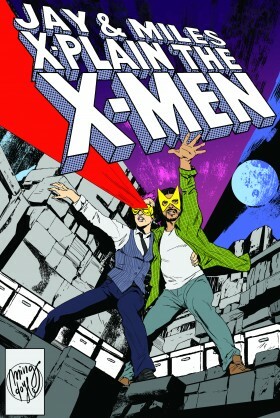 Again to reiterate, I LOVE this show and it has actually gotten me back into reading comic books! Pretty debatable depending on what book you read I suppose. Cognitive dissonance goes both ways. But either way I’m glad Rachel and Miles X-Plain the X-Men exists! Love the podcast, listening to it has been a wonderful follow-on to my recently-completed fifteen-year mission to read every Mutant title from Giant Sized #1 to the end of Fatal Attractions. Thank you so much for what you’re doing and making it accessible to everyone!